The Robert and Suzanne Tomsich Department of Cardiology at Cleveland Clinic Florida in Weston, Florida has a faculty position opening for a well-qualified Cardiologist with a special interest and advanced fellowship training in Heart Failure, Cardiac Transplantation and Mechanical Circulatory Support. The candidate must be board eligible or board certified in Cardiovascular Disease and Advanced Heart Failure and Transplant Cardiology. Proficiency in advanced heart failure therapeutics, endomyocardial biopsies and hemodynamic evaluations is required. This individual would develop a significant specialty focused practice joining two established heart failure specialists at the Clinic. Interested candidates will be responsible for continued growth and expansion of the heart failure service and the transplant and mechanical circulatory support program (both inpatient and outpatient) working in a multidisciplinary approach with colleagues in electrophysiology, cardiac surgery and general cardiology. The successful candidate will join a dynamic team that is coordinating clinical care, research, education, and strategic growth of Cleveland Clinic Florida’s heart failure services in collaboration with the Cleveland Clinic Heart and Vascular Institute in Ohio. The applicant should also have an interest in teaching; as we sponsor an ACGME accredited cardiovascular disease fellowship training program. 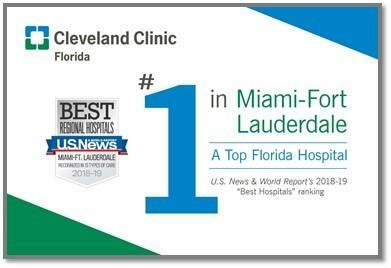 Cleveland Clinic Florida ranked #1 in the Broward County metropolitan area in the 2017-2018 annual survey of best hospitals by US News & World Report. Cleveland Clinic ranked 6th overall of 11 honorees by Diversity Inc in 2018. Companies on this list score well in talent pipeline, talent development, leadership commitment and supplier diversity.